Today we’re doing something a little unique. Our special guest this week is Mike Bjorkman. He’s a top producing Real Estate Agent, selling an average of 10 home every month. Mike is a stud. He’s completed over 4,500 real estate transactions and currently manages over 350 residential properties. 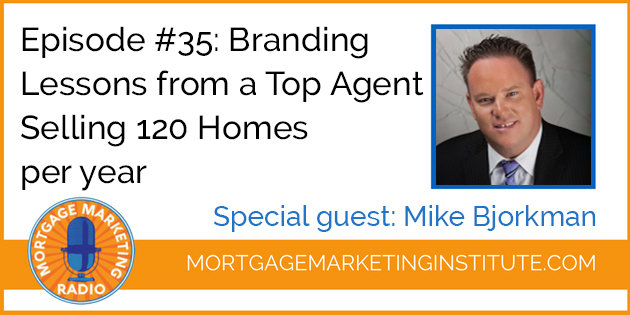 Mike is also a well known author, national speaker and trainer for some of the top agents across the country. He has been awarded a seat on the Top 5 Advisory Board and has made his biggest priority protecting, serving and educating his clients. What you’ll hear is some ideas on how you can position yourself in your local area as a mortgage loan originator and begin to build your brand and your presence so you attract top agents and consumer business to you. If you like today’s episode and want us to feature more top agents and talk about how we as loan officers can be more effective in attracting and converting real estate agents to referral partners please let me know.